Have you ever been in a situation where you had to write a special character that does not exist in your native language? Maybe it was an ü and you were corresponding with Herr Müller from Germany, or Søren from Denmark. Many European countries have special characters in their languages that others do not have. That's a problem as it is then not that easy to write a character unique to that language in Firefox or Thunderbird. One of the easiest options is to copy and paste whenever possible. While it is not possible to press a key to write the character, copy and paste works fine and the character will show up in the interface. Another option is to switch the keyboard language interface, but that's really only practical if you are writing exclusively in that language for a period of time, and not that useful if you only need a few characters here and there. 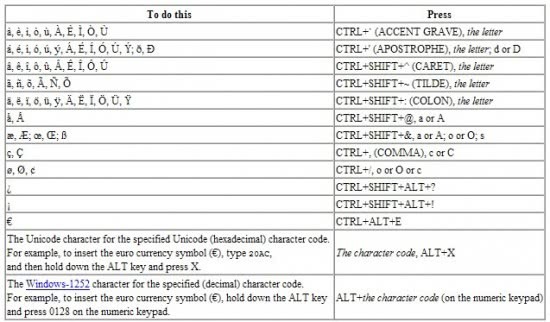 And then there are ALT characters which can be added to documents by pressing the ALT key on the keyboard and entering a number from the numpad of the keyboard. Problem here is that you need to know the number to use it. Zombie Keys for Firefox and Thunderbird offers an elegant alternative. The add-on adds a number of keyboard shortcuts to the program it is installed in. These shortcuts are used to write the foreign language special characters. Shortcuts have been reduced to a minimum by adding multiple characters to one shortcut. The user basically flips through all available characters of a shortcut. Zombie Keys works everywhere in the browser and email client including search, filters and comment forms. While you still need to learn the shortcuts it adds to the browser or email client, it is only about ten that you need to know if you want to know them all, or even less if you only require some characters. In best case, all you need to memorize is a single character. Zombie Keys is available both for the Mozilla Thunderbird email client and the Firefox web browser. Zombie Keys is an add-on for Firefox and Thunderbird that adds easy to remember shortcuts for international characters to the program. What is the prospect of Zombie Keys for Thunderbird 6.0. I miss it a lot!